The first time a quake is felt by people of the present generation in Penang was during the tsunami in 2004 that affected many Asian countries. The Indian Ocean earthquake destroyed many areas and killed many people, including Penang itself. Being the deadliest tsunami in the modern history, it is not surprising that George Town felt its effect that was estimated to equal the energy of 23,000 Hiroshima-type atomic bombs based on the findings of the US Geological Surveys. Worldwide, more than 150,000 people were dead or missing, and millions were homeless in 11 affected countries. Part of Penang's northern shores were destroyed, swept clean by the tsunami. The area which is now Straits Quay was once a tsunami hit area where the road dividers were thrown by the sea water to hit the kampung houses by the side of the road. Straits Quay today is a reclaimed land, which did not exist earlier. However, people seemed to have forgotten about the 2004 incident altogether as investors grab the new houses and premises even before the properties were completed. Recently again, the earth shook beneath the island. 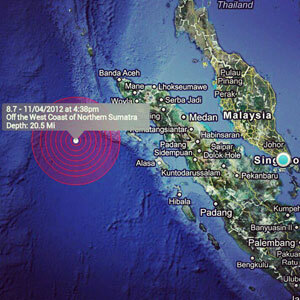 Tremors were felt and buildings swayed in early May 2012 and was felt by those who lived closer to the sea areas. Those who lived in the solid lands in the middle of the island did not feel it. However, the tremors had caused some panic especially those who were shopping at George Town's Prangin Mall, Komtar and 1st Avenue Penang. Some shoppers screamed in fear, and many rushed out of the building during the first tremor. Shoppers were hurried out of the buildings, and by the second tremor at approximately 6.30pm, the shopping malls and retailers had shut down their operations. Residents staying at the northern and southern parts of the island which is nearer to the sea also took precautionary measures of leaving their apartments and condominiums, going downstairs for safety reasons. Mobile phone services were disrupted for a while, and conjured images of horror and fear for the safety of family members that cannot be reached. Rumours spread like wildfire, with allegedly valid news of the government shutting down Penang Bridge. This caused some panic as people feared that the quake will be bad enough to make the bridge collapse, but the government announced that those were merely rumours and the bridge operations were as normal. Before that, horrific images conjured in the minds of people, such as, if the routes leading to the island were to be cut off due to the quake, how will the people survive? Where will food and other resources come from? What is the escape plan? Will the air ticket prices surge with a rush for safety in the mainland? Seismologists and geologists have already said that the Indian Ocean plate is not stable, and is bound to move again with even more frequency than previously. This means that the island will feel more tremors in the future. The tremors will not be directly upon Penang, but will be one that is passed on from the Indian Ocean to Sumatra, before reaching us here. If this is true, we must learn what we need to do when the next tremor happens. It is important not to panic at the first signs of tremors. Buildings may sway in Penang, and it is normal for us to feel dizzy when that happens. As our buildings may not have been engineered to be earthquake-resistant, move quickly and steadily out of the building to an open space. You will not be the only person finding the escape route from the building, so it is important to stay calm instead of being trapped into a panic that might create a stampede. Yet again, buildings collapse in earthquakes are more often seen in movies than in real life, and in Penang, you will find that the dangers from a tsunami wave will be more likely than a collapsing building during an earthquake. There is really no need to be too worried. Penang is still a blessed island, as it sits quietly and contented with whatever development that is going on within. It is still a beautiful tourist island, and a lovely home to almost two million people, a combination of both the island and mainland. Penang will still be here for a long time, earthquake or not.